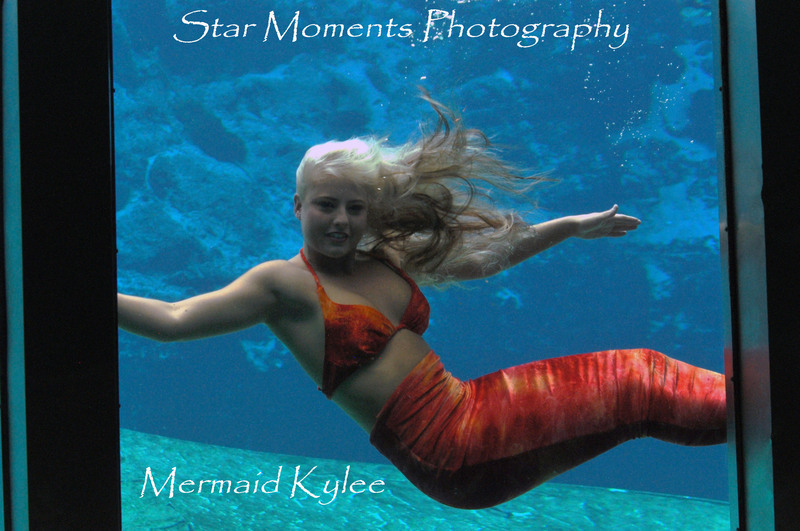 So Kylee Troche is a current Weeki Wachee Mermaid as well as the reigning Mrs. Weeki Wachee. That is right, there is an annual pageant at Weeki Wachee, every spring, which is really almost Americana overload. Mermaid pageant queens! 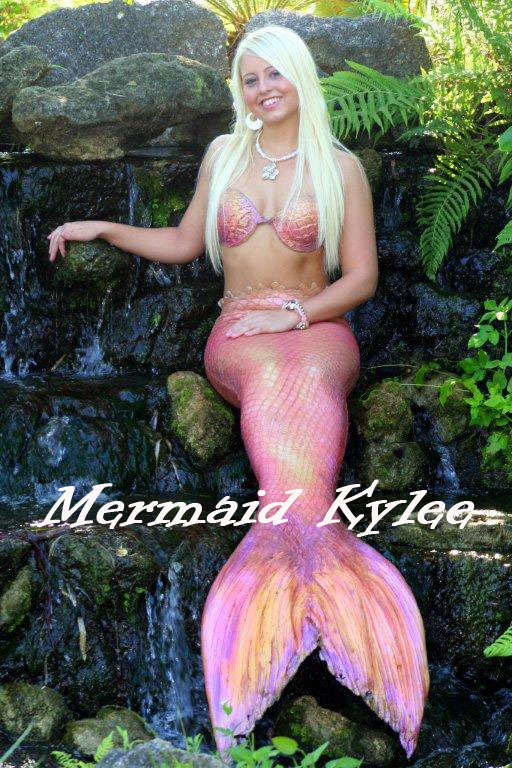 Speaking of which, Kylee will also be competing in the International Mermaid Pageant that will be held this Friday afternoon at the Silverton Hotel and Casino in Las Vegas, as part of the first annual MerCon and World Mermaid Awards. (Tomorrow, by the way, I will feature an interview from International Mermaid impresario Stephanie Sims). Kylee (and Stephanie) will also be present and speaking at the Amazing Pre-World Mermaid Awards Author Signing and Mermaid Ball at Barnes and Noble, which yours truly has been helping organize and which you obviously should attend, lest you spend the rest of your days steeped in regret and lamentation. Meanwhile, my Q and A with the lovely Kylee is below! So how did you become a Weeki Wachee mermaid? 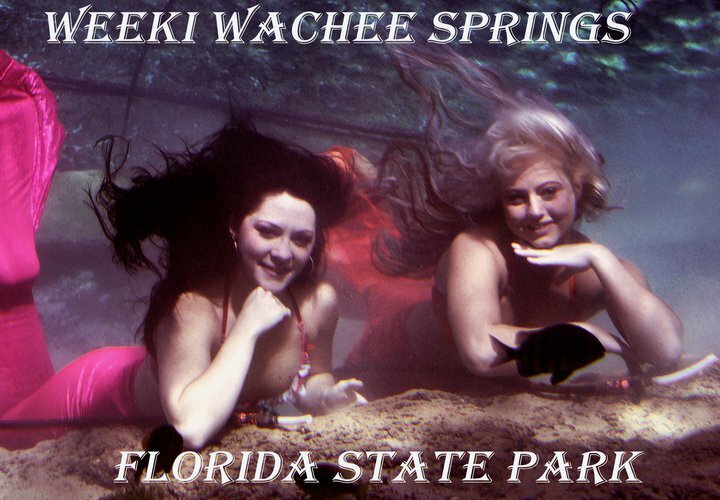 In 2007 I started working for Weeki Wachee in the gift shop. I had always dreamed about being a mermaid and would come to the park and watch the shows over and over again. I worked with some amazing women in the gift shop, Jill Roddis and Susan Ogilvie, and they encouraged me to follow my dreams and try out to be a mermaid. I had long blonde hair and I had extensive dance training since the age of three. Jill and Susan said to me those are things they look for in a mermaid. I was hoping that those qualities and the fact that I love to swim would help me. I was very lucky to get an audition, as there are thousands of girls that try out and apply to be a mermaid every year. However, I soon found out in the audition that there are more factors that play a role when trying out to be a mermaid, like having breath control (very important), and being able to open your eyes underwater and smile while looking like you know what you are doing. But I was very lucky and made the cut in 2009. I became a trainee; you have to go through the proper steps to be awarded the title of MERMAID. First, you must be scuba certified, and then you must train for many months learning choreography, technique and how to breathe on the air hose. When you get approved to be in a show you usually play sister three in The Little Mermaid (one of the two shows at Weeki). Then you have to keep learning different roles in the show (sister two, Chester the Turtle and then the Witch) and then you have the other show we do with different choreography called Fishtails, for which you must learn to eat and drink in the water. During this time you are moved up from training status to Novice Status. This is where you take a written test and must past a skill test with the head mermaid. Then you move on to play more parts in Fishtails and learn more choreography and then the dangerous deep dive that’s at the climax of the show, then finally you get to learn to play the little mermaid herself. But you are still not considered Mermaid Status. At that stage you must complete another written test, make up your own choreography and develop a new underwater mermaid move, and be CPR certified and First Aid Certified. Once you test in front of your fellow mermaids, the head mermaid and guests, you will can finally be awarded the title of a FULL FLEDGED WEEKI WACHEE MERMAID. For some, it takes years to accomplish this task and some mermaids never even make this status and quit being a mermaid. For me I feel very blessed! I worked and worked and put in extra time and practiced and was able to become mermaid status on September 22, 2010. Can you tell us about a typical day at Weeki? I am usually an opener, I like to be the first one at work and help the other girls. I arrive around 9:00 in the morning and I pick up all the tails from the last show the day before that are on the drying rack and put them away to start off our new day. Then I check to see if any of our tails or tops need to be repaired and repair them if needed. We always wear tights under our tails to help keep us warm and to help with quick changes during the show. So I also put away a lot of tights too from the drying rack. I have to check the Ponies (this is what we use as safety air in the airlock) to make sure they have air and are in the right location before swimming in any show. I go into our underwater theater and check to make sure it is clean and then wipe down all of the windows in theater, so that guests get to enjoy the mermaid show with no hand prints. Then it’s time to get ready for the show. This is when all mermaids performing discuss what color tails we are wearing and find out the show schedule and who gets to play what part in the show. Then it’s make-up time for all of the performing mermaids. Depending on what part you play in the show depends on the style of make-up you apply. The witch mermaid gets a totally different look of make-up then the rest of the mermaids. Then its show time and we perform for 30 minutes underwater in temp of 74.2 degrees. When a show is over we remain in the water and do our chores, like underwater cleaning and setting up our hoses for the next show. Then we get to get out of the water and get in the showers. Warm up a bit and then repeat. This happens three times a day 365 days a year. I love being a mermaid! 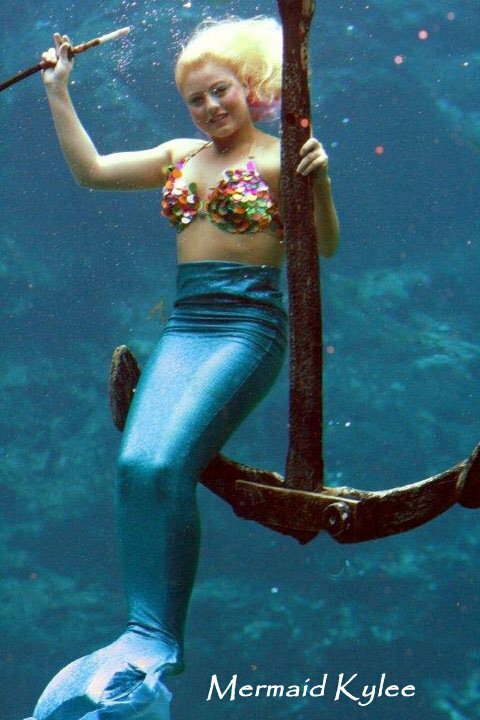 Can you share some interesting opportunities you’ve had as a Weeki mermaid? My favorite opportunities are the wonderful PR’s we go on to all the different places, such as private parties, the local Tampa Boat Show, and store grand openings and aquarium events. But the best place I ever visited as a mermaid was the Georgia Aquarium (the world’s largest aquarium), where I had a very unusual experience with a very large, let’s say massive, whale shark. We had just arrived at the aquarium to train for the special Christmas show. We were learning all of the special things you must know when you swim with dangerous sharks and manta rays, and all the aquarium rules. I got in the water and started to practice when a beautiful whale shark took my hose right out of my hand. The rescue diver tried to bring me air. But I had to surface as I had swallowed way too much water and could not get a breath of air. It was an experience that at the time was a little scary, but turned for me into a love of the special whale sharks. They seemed to want to protect me and stay close to me when I performed. I really enjoyed the opportunity and hope to be able to go back again next year. How/when did you become Mrs. Weeki Wachee? I was titled Mrs. Weeki Wachee 2011 this year on March 6. I entered in the pageant that was held at the Weeki Wachee Mermaid Theater. There were two categories we were judged on: Swimming Suits and Formal Gown. Have you been in, or do you plan to be in, other pageants? Yes, I have been in other pageants and held other titles. In 2008 I was crowned Miss. Teen Ybor City. In 2009 I was crowned as Miss Hernando County. In 2010 I was Titled Miss Gasparilla Ultimate Grand Supreme and also took the Talent Title as I performed one of my competitive dance solos and won Gasparilla Calendar Girl Model. I won KAR title this year as Mrs. Photogenic and will be featured in 2012 KAR Program. I also was a professional signed model for three years with an exclusive signed contract with the modeling agency Michele Pommier Management of Miami Beach, Florida. Can you tell me about some of the exciting stuff you have coming up? This week is the awesome First Ever Mermaid Event in Las Vegas! This Thursday August 11, is the amazing Author signing and Mermaid Ball at the Rainbow Boulevard Las Vegas Barnes & Noble at 7:00 pm; I will be there talking about my experiences. On Friday, August 12, is the Mer-Con, the International Mermaid Pageant (in which I’ll be a contestant), and the World Mermaid Awards, all at the Silverton. And then on Saturday, August 13th, I have a photo shoot with the fabulous Susan Knight, followed by the VIP Mermaid Pool Party. Also, there are a few magazine interviews that you will soon see me in, and I have an interview for a documentary. I also have a very exciting PR next month with Weeki Wachee that I have been choreographing. It’s a special dance that has six of the Weeki Wachee Mermaids performing. And then of course I am working on extra practices because Weeki Wachee offers an exciting Halloween Event with a night time underwater show and a dry dance performance in the underwater theater stage. These are very unique shows and change ever year with a new theme. If you have never seen a Mermaid Show at night in the Underwater Spring you really need to come. It is always a wonderful show. Why do you think mermaids are so popular, anyway? I feel this is our year, The MERMAID year! I think vampires have been done (Twilight) and Wizards (Harry Potter). The public needs a new magical mysterious icon and Mermaids are it! I believe we are something people have always dreamed about and have loved. Folklore has been told about mermaids, their magic and the connection with sea. Now people want to embrace it themselves and experience mermaids. I think that whatever you do… just never let anything stop you! Follow your dreams and never be afraid of new things because you never know what it might bring.